I am the queen of flip flops – not out of love but necessity mainly. With my MS I personally find I can’t stand when my feet or neck get hot. It is also a lot easier for me to slip on a pair of flip flops rather than tennis shoes as my everyday shoe. With winter here my husband had a fit that I was still wearing flip flops. At the time my balance was too bad to even consider wearing my winter boots. 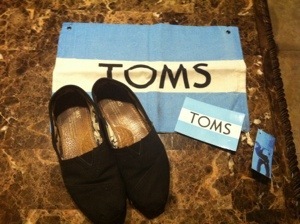 Another friend with MS told me about Toms and how she LOVES the shoes. So off to the store Resa and I went. I do believe I have found my new everyday shoe. Not only are they easy to slip on, they look really cute and are comfortable. The shoes are lightweight, which is a must for me, but the soles are comfortable with just enough cushion to your walk. I am very hard on shoes because of the way I walk. With the balance problems of MS I tend to walk on the inside of feet. Shoe soles tend to wear out very fast for me but so far the Toms are still holding up very well with minimal signs of wear. 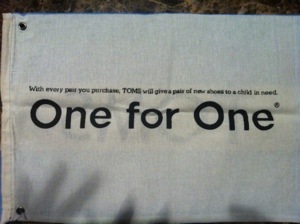 I also liked that Toms has a One for One program. With every pair of shoes you purchase they help someone in need. Don’t worry guys, they have a men’s line as well. Toms also has boots and sandals available.